Will Digital Culture ever invent a Homer Simpson? 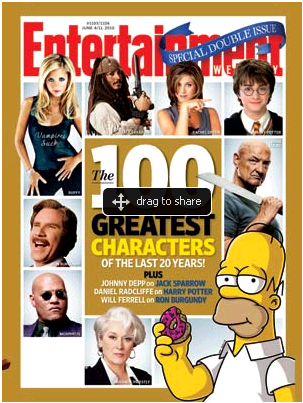 Entertainment Weekly recently gave us the "100 greatest characters of the last 20 years." The list includes Buffy, Jack Sparrow, Rachel from Friends, Harry Potter, John Locke, Miranda Priestly, and Ron Burgundy. In his latest book, Clay Shirky suggests that we now have around 1 trillion hours of creative surplus at our disposal. We use this time variously, offering Lolcats and, yes, blog posts. Will Shirky’s surplus ever create a character that will appear on the Entertainment Weekly list? Will we ever create our own Homer? I am not being argumentative. This is an open question. The answer could be "soon" or it could be "never," and I’ll be happy. However we answer this question, we will have improved our anthropological understanding of contemporary culture. There is a general presumption, I think, that we are sitting on a gusher. Shirky’s surplus is so vast, so inexorable that the creation of an EW "100 winner" can’t be far off. And it’s not that we are talking about the proverbial 100 monkeys. It won’t happen by evolutionary accident. It will happen because our use of the Shirky surplus gets better and better. This argument says "soon." Some will say our surplus is already in evidence on the EW list. They will say that these creatures are the result of user participation, consumer cocreation, the agency and activity of fans, transmedia assembly, textual poaching, and a liberal borrowing from the cultural commons. Homer Simpson is all about borrowing and, like any bard, his standing depends finally on our consent. This argument says "already." But there is an argument that says "never." The red neck version of the argument rehearses the idea that popular culture is a waste land. Thus speak Keen and Bauerlein. But there’s a more sophisticated approach that says the creativity of the internet is a derivative creativity, that mashup culture must begin with something first to mash. Our culture may be in the direction of the consumer-producer but it will always depend on the producer-producer as a kind of "first mover." Let’s push things a little further. (And again I do this for the sake of argument only. Living at the intersection of Anthropology and Economics, I can be ecumenical on a question like this.) What if the people who make Homers and Buffys must be funded by something other than the "creative surplus." Must there be an enterprise that engages people to invest financial and creative capitals in a (relatively) expensive and therefore risky productions which then compete in some cultural marketplace. This would make a dandy topic for a Futures of Entertainment session, with Shirky, Henry Jenkins, Larry Lessig, David Weinberger, Dan Snierson, Jeff Jensen, and several other thinkers. With Sam Ford moderating, of course. Anonymous. n.d. "Lolcats" entry on Wikipedia here. Bauerlein, Mark. 2009. The Dumbest Generation: How the digital age stupefies young Americans and jeopardizes our future. Tarcher. Jenkins, Henry.2006. Fans, Bloggers, and Gamers: Media Consumers in a Digital Age. NYU. Keen, Andrew. 2008. The Culture of the Amateur: how blogs, MySpace, YouTube, and the rest of today’s user-generated media are destroying our economy, our culture, and our values. Broadway Business. Shirky, Clay. 2010. Cognitive Surplus: Creativity and Generosity in a Connected Age. Penguin Press. Snierson, Dan, Jeff Jensen, and many others. 2010. The 100 Greatest Characters of the last 20 years. Entertainment Weekly. Double Issue. No. 1105 and 1106. June 4 and June 11. here. Thanks to Gareth Kay for telling me about Shirky’s new book. This entry was posted in Uncategorized and tagged Andrew Keen, anthropology, Clay Shirky, Dan Snierson, David Weinberger, economics, Entertainment Weekly, Gareth Kay, gift economy, Henry Jenkins, Homer Simpson, Jeff Jensen, John Carey, Larry Lessig, Mark Bauerlein, Sam Ford on July 29, 2010 by Grant. I’m of the belief that having a paid engine of writers, editors, and producers produces the collaboration that gives us great shows like the Simpsons. The show grew over the first few years, evolving from one man’s vision to a cultural icon. While the creative surplus may exist, aren’t we as a whole also filling it with plenty of nonsense? More work, more reality television, maybe more time with our kids? I don’t think that the enterprise gives birth to the ideas, but the collaboration it allows does make things better. A parallel might be the internet journalist versus the fully funded news room. Grant, I’d say that there’s a lot of interesting creativity being demonstrated online at the moment, and the question at this point remains whether Homer Simpson could have become Homer Simpson online at the point. That is, Matt could have created him, but are we to the point that a character launched online would have that ind of penetration into our society? I am thinking probably not…But take, for instance, all the online soaps launched in the wake of the soaps’ cancellation, from Steamboat to Gotham to Reality Bytes. Thanks for bringing up that fascinating question. Difference to me is that Homer wasn’t something you could share, access 24/7 so Homer became a rendez-vous, part of your life and became Homer to a certain generation. Today’s digital natives are creating Homer’s through sharing, friending and more… @aplusk might be that new Homer. But because media aren’t used in silo anymore you can’t have that massive adoption, options are endless and aren’t limited to a country or a culture. So your Homer can be a character that is supported by 10,000,000 people but totally unknown in your own country/culture. Internet might be able to create bigger than Homer, Internet can create a new Mona Lisa. The Entertainment Weekly list is a highly problematic measure of the creative surplus, because such lists implicitly presuppose some degree of a common mass culture, whereas mass culture is specifically that which is undermined by internet-enabled cultural surplus. If the common culture fragments into thousands of mutually unintelligible subcultures and subsubcultures, it’s not obvious that a best-of-the-decade list even makes sense. I honestly have trouble believing that Homer Simpson is really one of the best-designed or best-written fictional characters of the last twenty years with respect to a non-gerrymandered aesthetic standard. But the pick makes sense: the economics of television are such that the editors of Entertainment Weekly can expect that a large fraction of their audience will have seen The Simpsons at least in passing; whereas if the editors had picked any (say) webcomic character, no matter how well-written, most readers would say, “Who?” It’s not only because there are more television-watchers are more prevalent than webcomic-readers; rather (I submit) it’s that webcomic readers are more heterogenous. CORRECTION TO PREVIOUS: That last sentence should start, “It’s not only because television-watchers are more prevalent than webcomic readers”. I was going to leap to Homer’s defence, but on reflection I think Zack has a point that Homer is more representative of the quality of the show as a whole than the individual character. 2) If the criteria are that little bit relaxed, then how different is an internet author from the creator of Harry Potter? It’s a different economic model, but the notion of an artist creating something, then finding a way to monetize it seems fairly similar. 3) Books are the most obvious source from the pre-internet era where the creator can do a lot of moving without the producer. The standard argument goes that with declining costs this can start to happen in other media too. But you’d bet on it being text or drawings first. Or maybe radio/podcast. Visuals are still quite expensive. I think Indy is right on. I suppose that somewhere in the back of my brain I feel like the “mass culture/niche culture” thing is a false choice. Neither will die. And monetization is an enormous part of this equation, which I am decidedly uneducated about. Zack Davis’ questions begin to help frame the original question and make it something meaningful. What is meant by “greatest character?” In EW’s case, it’s likely a character that has broad enough appeal that including it in the magazine will help sell more copies. Others might impose a more interesting, or thoughtful, evaluative framework. What’s the range of work from which the “greatest” were selected? We can be pretty sure EW’s editors didn’t go through the body of work of poetry, short stories, novels, films, etc. for the last 20 years (much of this, of course, is not accessible on the internet). And comes the standard question: greatest to whom? If we use EW’s evaluative framework, then necessarily we must take fragmentation into account. After all, Hollywood reports box office dollars rather than the number of tickets sold in part to avoid reminding us, every week, that the high point of movie attendance was more than 50 years ago–and that with a much smaller national population. One of the interesting things about Homer Simpson is the degree to which at least the character’s image has reached those who don’t watch TV. How might characters with a niche web audience depart the internet and gain a broader following, such that they will drive EW sales? To side step the debate going on within the comments section so far, I want to clarify some things and ask some others. Firstly, I haven’t read Clay’s book, so I may be wrong in my assumption that it’s about the giant mob of internet creativity from Kickstarter-funded projects to crowd-sourced mashups. That sort of thing. Secondly, I see the EW list as characters who became famous on two conditions: 1) an initial single-author vision as a starting point, and 2) a progressive honing and evolution within a professional team. So for me, much of what the trillion hour surplus is does not involve either. But in so far as say, Kickstarter funds condition 1 (a strong initial vision) and that, at a later point, self-organizing and committed communities form around cultural production… then there will be a Homer. The catch? That creativity under these two conditions is, by definition, not part of the surplus. To actually determine whether digital culture will invent a Homer Simpson we must simply determine the general conditions that render a creation a contemporary culture icon, and if they can be met, by today’s standards, by this medium. Contemporary culture is, as I perceive it, a way of thinking that is shared and developed by the interaction of a certain and significant number of people on a significant and still growing time period. It must not be confused with trends for they are very short lived. Can the digital world deliver these conditions in it’s present form? 2.The way that people are currently handling the internet is that they skirmish through the chaos. It’s like when you buy a magazine and you go through the pages first, before actually reading it. 3.It lacks in interaction. Despite the ever growing social networking it can never supplement the physical interaction that can be provided by other means because culture needs a nesting area to grow and the randomness of internet is not well suited (too much fracturing).